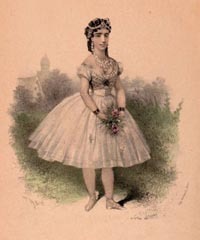 She created the role of Swanhilda in Léo Delibes ' ballet Coppélia on 25 May , 1870 , aged only 16. She danced the role only 18 times before the Paris Opéra closed for the duration of the war with Prussia . Without food or money, she caught cholera, which was spreading through Paris and died on the morning of her 17th birthday .